Outstanding bicolor sunflower dazzles with sensuous, high-definition color and outright drama. Wine-red ray petals tipped in rich yellow orbit dark center disks packed with 600 tiny flowers. Massed in a border or a choice sunny spot, hardy, multibranching 5-6’ plants exude chromatic pizzazz. 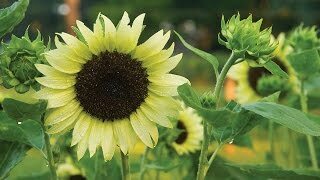 Mingles marvelously alongside other disc flowers with bright yellow centers. Produces vase after gorgeous vase of cut flowers. Easy-growing plants thrive in moist soil. A magnet for color-loving bees, birds, and butterflies. Sunflower, Crimson Blaze is rated 3.5 out of 5 by 2. Rated 5 out of 5 by Celeste1972 from Exquisite! Crimson Blaze sunflowers are perfect! Their color and their size make them perfect for a country flower garden or in a container with other flowers. Blooms last a long time. I will be planting these again next year!